The Sheep Heid Inn, a great pub in a good location, was an excellent choice for a friends and family weekend dinner. With it’s extensive menu of Scottish classics, quality grub and seasonal produce, there is plenty of choice and the gluten free eater will not feel left out. The most important thing to note is that you need to book in advance – this place is popular! Set into a small village with narrow streets and just a stone’s throw from Arthur’s Seat, you can well imagine that the walkers and diners are going to flock here. There is a good sized courtyard garden, gluten free beer and even an old skittle alley – it’s an Edinburgh classic. I knew from previous visits that the chips are not gluten free (sadly), though there was a gorgeous selection of chips for the gluten-eaters of our party – but it was not to be. However, while the menu is keen on pies, burgers and breaded things, there is still plenty of GF choice. Our server sat down with the allergen menu to ensure my choices were ok, and I was not missing out. 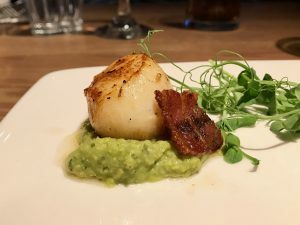 There is a scallop starter of the day, so that was a must: minty pea puree, bacon and three tasty, fat little scallops was a picture perfect way to begin and it was a brilliant choice! The bacon was crispy and the minty puree was not overpowering. My main course of lamb rump with onions, potato dauphinoise and asparagus, was a bundle of delicious flavours. The huge portion of potato beat me, but was finished by a hungry teenager, and the good, plump chunks of lamb were tender and delicious. The asparagus too, had a bit of crunch rather than being soggy, as it can sometimes be. As I mentioned earlier, there are quite a lot of pies on the menu and if you dine here you’ll be avoiding the burger, given the lack of bun and the chips issue, but there were also vegetarian choices, meats, steaks and salads that would all suit the GF requirement. I avoided puddings after that pile of potato, but the GF puddings included ice cream (obviously!) and a couple of others but, as always, this bit of the menu was not extensive. …. The wine was good, there are two gluten free beers on offer in the bar (though, sadly, not the local Bellfield); and service was relaxed and friendly. This is good quality, plentiful pub grub with a focus on flavours and tons of atmosphere and pubby buzz. If they just sorted out their fryers so we could have some GF chips, I think I’d be giving the Sheep Heid Inn top marks. The Sheep Heid Inn has a sister – The Salisbury Arms – opposite the Commonwealth Pool, which is another great pub option and has a similar menu. You can book both of these online.